Businesses founded by graduates from Teesside University are proving to be some of the most viable in the country. Bob Makin (left) and Darren Cuthbert (right), founders of SockMonkey Studios. Figures released by the Higher Education Business and Community Interaction Survey (Hebcis) show that in 2016/17 there were 143 start-ups founded by Teesside University graduates which were still active after three years of business*. The Hebcis figures also reveal that graduate start-ups from Teesside University had an estimated turnover of more than £20.8m. Teesside University places a strong emphasis on entrepreneurship as a career path for graduates and enterprise is embedded throughout its curriculum. The University is one of a handful of universities in the country to run the BA (Hons) Team Entrepreneurship degree which is inspired by the Finnish Team Academy and offers students a chance to direct their own learning and participate in team sessions, rather than attend lectures. As part of its £21m revamp, Teesside University Business School has also launched a new Masters of Business Administration (MBA) degree inspired by Babson College in the United States, a global leader in the teaching of entrepreneurship. In addition, Teesside University runs a number of projects designed to support start-ups in their early stages and give entrepreneurs the skills and knowledge they need when it comes to growing their companies. The Launchpad business incubator based at the University’s Middlesbrough campus offers a co-working space where students, graduates, alumni-entrepreneurs, SMEs and corporate partners can come together in a unique start-up eco-system. The University-led DigitalCity, Innovate Tees Valley and Innovate Durham projects provide a range of support, funding and mentoring to ambitious businesses that want to grow through innovation. Laura Woods, Director of The Forge, Teesside University’s business hub, said: 'These figures show that not only are our graduate start-ups making an important contribution to the region’s economy, but they’re also delivering sustained impact after three years. It demonstrates the value of targeting support on strong and innovative businesses that understand the need for customers. Successful businesses found by Teesside University graduates include Visualsoft, Animmersion, SockMonkey Studios and Hammerhead VR. Games company, SockMonkey Studios, founded by two Teesside graduates, has grown to employ nine people, with plans for further expansion, thanks to the support of the University. SockMonkey Studios started with the help of Digital City, a Teesside University project, and wouldn’t still be here today if it wasn’t for the University. The company is based in Boho 5, in the heart of Middlesbrough’s tech quarter, and works on console, mobile and VR games for clients, as well as developing its own intellectual property (IP). Its clients include some of the biggest names in the worlds of digital and business including Sega, Motorola, Lucasfilm and Unilever. 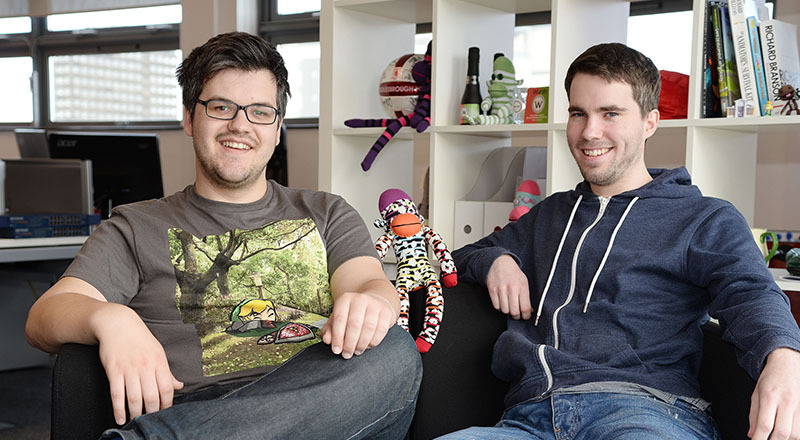 SockMonkey was founded in 2013 with the support of a DigitalCity Fellowship after Teesside University graduates Bob Makin and Darren Cuthbert left their jobs with a large games studio with the ambition of setting up their own business. The Fellowships support entrepreneurs who are launching or planning to launch new-to-market products and services with up to £5,000 in funding, along with support and mentoring. SockMonkey’s first app, Wurdy, a word guessing game, was featured by Apple in 147 countries and reached the number one spot in two countries. The company was initially based in Launchpad, Teesside University’s business incubator, before expanding into larger offices in the University’s Phoenix building. As the company continues to expand, it has recently taken part in the DigitalCity Scale programme which helps ambitious tech companies scale and grow. It is also working with Teesside University, as part of the Creative Fuse project, to develop an interactive system platform for patient education. The project will produce a mobile app featuring engaging visuals and gamification to help communicate information about bariatric surgery easily, in a way that can be personalised and encourages user interaction. Bob Makin said: 'SockMonkey Studios started with the help of Digital City, a Teesside University project, and wouldn’t still be here today if it wasn’t for the University. 'They have helped with mentoring, business growth and office space via the Fellowships and Launchpad, and have helped to grow us from a small start-up of two to our now nine-strong team. Businesses founded by graduates at Teesside University are among the most successful in the country. Businesses founded by Teesside University graduates are among some of the most viable in the country, a new survey says.